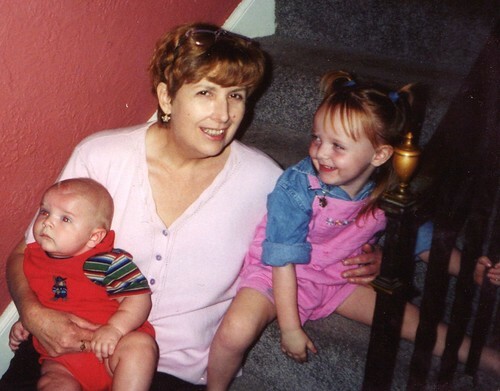 Three years ago, today, April 27, 2008, my mother went away from us forever. I miss her, of course. It helps to remember her and her stories and the gifts she did leave behind. My mother was talented and remarkable in so many ways. She could design and sew whole sets and period or whimsical costumes for a community play. She wrote plays. She designed and drew in meticulous pen and ink, the theater posters. She wrote music. And so many other things, like poetry. She wrote this beautiful poem when our daughter, Olivia was born in 1997 and we used it a year later in Olivia's UU dedication ceremony. She was so many things to me, but for today, I remember my mother, the poet. A grove anchored by labored till. To trade, to deck the festive hall. A dampened breeze from cloud to cloud. While lonely Noah sails the flood. (Which is the fuel upon the steel). Upon the hearth, and pots are cast. Explodes on Troy to burn and boil. An icy comet soars the skies. Are christened when Aurora cries. A dove's green promise brought to earth. *Hale Bopp comet was visible in 1997, and we could see it in the dawn sky while I labored with Olivia. **Olivia was born March 13, which makes her a Pisces, The Fish. I know I won't say this right, but I mean it with a full heart -- I know that nothing, even time, takes away the pain of life with certain parents. But to have something tangible left behind, such as words or music or poems. It is like a gift - that behind the chaos there was much good and beauty and clarity too. And love for you. And I hope that is some comfort to you. And what a beautiful thing to give your daughter, to keep and hold and perhaps even pass along to her own children. Oh Denise, you said everything right. Thank you for your words and your full heart. Yes, it's these tangible things, as few as they are, that keep her close, that preserve her truest self, that mark her from the days she felt lost. Olivia was moved when she read this. I had shown it to her years ago, but she was little and she understood its full meaning today, which was healing, too, because now Olivia knows that my mother loved and thought about her granddaughter. Yes, all those things, thank you so much, Denise. Hi! I'm a first time reader to your site. I can't imagine losing one of my parents. I've had grandparents and uncles die, but I've never had anyone really, really close to me pass away. I really loved reading this poem. I thinking having something someone wrote is one of the closest things you can have that is a part of that person.